I want to decorate my house with LEDs strips on each step of my stairs. I will buy LEDs strips with a 12V power supply. I want that if I put my foot on the first step, the first LEDs strip turn on, and after every second, the next step turn on too until the last step. After 10 seconds on, the step must turn off. To detect my foot, I'm thinking of using that kind of component : PIR (motion) sensor (product 189 on adafruit website). It act like a push button. My first thought was to create two circuit loops. One to supply the LEDs strips with a transistor between each strip. And the second to control the transistor, so the turn on/off signal. Thanks to your advices, I decided to use an Arduino to do the control loop. I found this (http://www.zem.fr/decouverte-du-composant-74hc595-8-bit-shift-register/): It's two 8-bit shift register, I have 16 steps on my stairs. With a simple bit of code, I successed in writing a Arduino code that push ten HIGH(1) bits from the right then sixteen LOW(0) bits. So I have what I want with the LEDs. The question is : how to connect the 16 LEDs strips with my circuit (instead of the single led) ? English is not my native language, I tried to do my best. Assuming your LED strips are essentially "always on" when they have power, you could replace the single LEDs in your diagram with transistors that sit between the power supply and the strip. Then, when your Arduino pin goes high, the transistor turns on the LED strip. Not the answer you're looking for? Browse other questions tagged led electronics transistor or ask your own question. How to fix 12V RGB LED Strip connection to NodeMCU? How to switch an external circuit with Arduino? 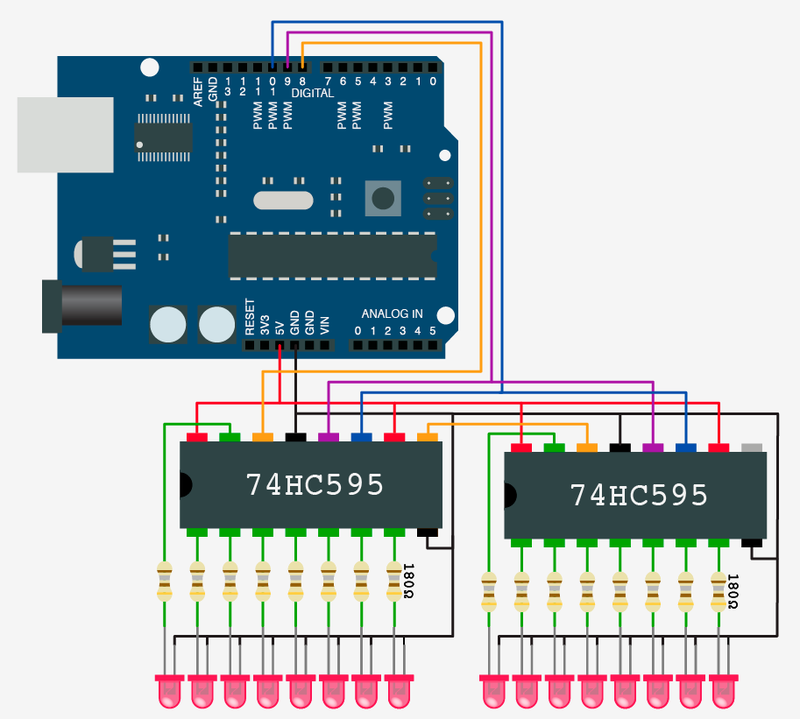 How many LED Strips can we connect to an Arduino Uno? Is there a way to connect 1-3 meters worth without needing extra parts (relays)? Do I have to wire up my WS2812 LED strip in “series”, if I want to address each LED individually?